At EDT we can test and assess your current English and Maths skills against the national standards, address any shortcomings you may have and get you through the exams quickly, and at a time and pace to suit you. Don't panic if you haven't studied maths or English for a while. 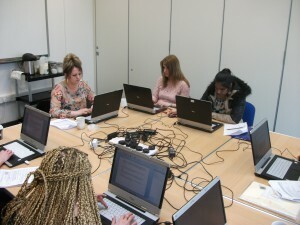 When you enrol you will be given an initial assessment to make sure we place you on the correct course for your level. Once your current level has been determined an individual Learning Programme will be developed to suit your needs. or send him a message via the form below. Functional skills are essential skills in English, maths and ICT that enable everyone to deal with the practical problems and challenges of life – at home, in education and at work. They are essential to all our lives. For example, they can help us recognise good value deals when making purchases, in writing an effective Job or College application letter, or when using the internet to access local services or online banking. The key is they are about using English, maths and ICT in everyday situations. Improved functional skills are linked to a range of benefits. These include: Increased self-confidence and confidence to support children’s learning - Improving people’s lives by reducing social exclusion and Improving a person’s employability. Taking a free Functional Skills course at EDT could help you get to grips with your maths and English, improve your IT knowledge, increase your confidence and enhance your CV. If you need a maths qualification to improve your CV or boost your confidence, the Functional Skills maths qualification is a great way to show you can apply your maths skills in a practical way. National Numeracy Challenge - This is a confidential, friendly, easy to use interactive website designed to assess and improve your everyday maths skills in bite-sized steps, while building confidence along the way. It takes a couple of minutes to register and you can then take the assessment test and set goals to aim for - studying at your own pace all the way. An excellent numeracy resource that's well worth investigating. Move On - is a national project funded by the Department for Education and delivered by Skills for Life. The project aims to help adults to brush up their skills and gain the National Certificate in Adult Literacy or Numeracy. There is a large amount of content to suit all levels of ability - including a substantial archive of practice tests for you to have a go at.